Green Willow Tree has not offered a good Vitamin C product in several years. This one meets our criteria for absorptivity and gentleness to your stomach. It's a convenient source of vitamin C to support healthy immune function. Vitamin C—an antioxidant that strives to protect your cells from potentially harmful free radicals—may help address certain symptoms associated with the common cold. 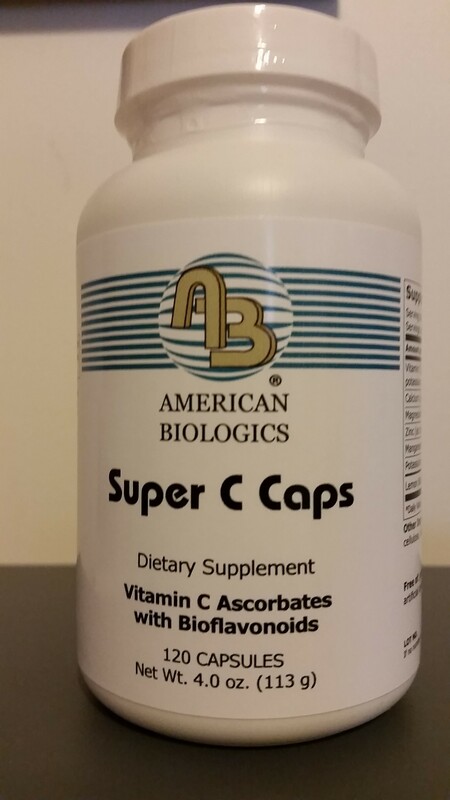 A capsule of Super C Caps contains 500 milligrams of vitamin C ascorbate. In addition‚ this supplement provides citrus bioflavonoids that may work with vitamin C to further promote general health. Due to the fact that Super C Caps have been formulated to have a roughly neutral pH of 6.5‚ this supplement may be less likely to cause digestive discomfort than other forms of vitamin C.
Other ingrediants: gelatin, magnesium sterate, cellulose, silicon dioxide. An adult dietary supplement. Take one or two capsules daily with meals. At the recommended dosage‚ each 120-capsule bottle of Super C Caps by American Biologics should last for about two to four months. Store in a cool, dry place. Pregnant, or nursing mothers should consult a physician before using any dietary supplements.